Will the LHC Prove the Existence of Higher Dimensions? And possibly an elegant Theory of Everything. How many dimensions are there? Is time a dimension? Or is our 3-dimensional space-time just one element—and a minor one at that—of a greater hyperdimensional universe? It’s a question that’s been asked many, many times, and the answers can be almost as varied as there are potential extra dimensions. From Paul Ehrenfest’s exploration of 3-dimensional physics in 1917 to the M-theory of the 1990s, experts throughout the years have proposed their own answers—some more forcefully than others. But with advances in technology, and armed with new mathematical models and theories, we might be in a unique position today to begin to understand one of the natural world’s most baffling mysteries. 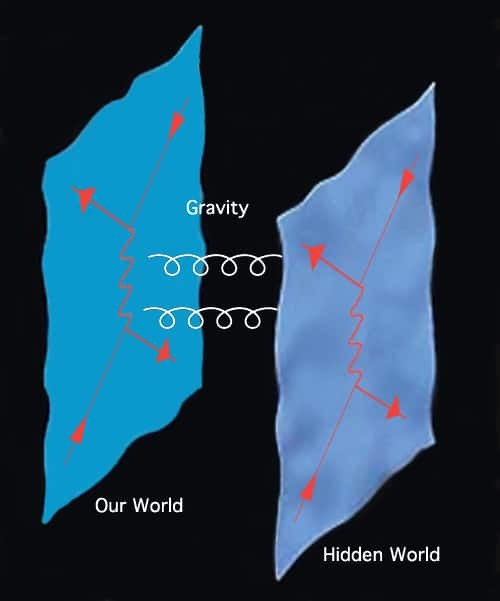 At the heart of almost all theories that deal with the number of dimensions are the fundamental forces of gravity and light, both of which are possibly the most observed and easily the most studied phenomena in the physical universe. Among the four fundamental forces in nature—the others being the strong and weak nuclear forces—gravity and electromagnetism (which is responsible for generating light) are the trickiest to deal with. Individually, they’ve caused grief to countless scientists and theorists; and when put together, they wreak absolute havoc. Models generally draw from these observable features of the universe to build theories and conjectures about how things work. The simpler ones proposed that the universe was made up of three dimensions: length, width, and depth. This is especially easy to grasp since it’s how we perceive the world; it’s intuitive and entirely logical. But this neat, trinary division of the universe doesn’t exactly sum up how we experience it. To build on this, some mathematicians—notably Hermann Minkowski—combined the three spatial dimensions with a fourth, temporal dimension, to construct a space-time description of reality. This is where things start to become knotty. There are embarrassing discrepancies and inconsistencies that just don’t seem to tally. For instance, why does gravity operate on such a massive scale—planets, stars, galaxies—whereas the other forces act upon such a tiny scale? Or, put somewhat differently, why is gravity so much weaker than the other four fundamental forces? So a number of theories were evolved to attempt to compensate for these discrepancies. Building on the work of Theodor Kaluza and Oskar Klein in the 1920s, superstring theories advanced the idea that the vibrations of minuscule energy strings were responsible for all that we observe in nature; these theories only worked, however, in a universe comprising ten or more dimensions, with the extra six or so all “compactified” into a tiny space beyond the limits of ready observation. Another approach (M-theory) subsumed this 10-dimensional universe, composed of strings and energetic membranes, within a large, potentially observable extra dimension called the “bulk.” In this notion, matter and energy and most of the fundamental forces cling timidly to the energetic space-time membranes, or “branes;” gravity, however, is something of a free agent, operating alike on the branes and within the hyperdimensional bulk. For this reason, gravitons—the carriers of gravitational energy—can bleed off into the bulk, diminishing the small-scale strength of gravity but still allowing it to exert undue power over large distances. Enter the Large Hadron Collider. The machine, based in Geneva, Switzerland, just might hold the answer to the dimensional puzzle. Capable of running extremely high-energy particle collisions, experts are able to construct specialized experiments which might, in turn, yield data that point to theories that actually hold water. Right now, scientists are looking for three specific occurrences to prove that higher dimensions exist: the presence of massive particle traces, sort of like reverberating echoes; missing energy caused by gravitons migrating to higher dimensions; and microscopic black holes. Ongoing experiments will explore these possibilities, just as scientists are hotly pursuing an elusive theory that unifies all the laws of the universe. If the volume of discoveries in recent years is an indicator, then we just might be closer than we ever thought. Physicists Weigh In: Could We Ever Travel to a Parallel Universe? The Edge of Physics: Do Gravitons Really Exist?